Ates Orga reviews the Malta Philharmonic Orchestra’s last concert for the season. The Malta Philharmonic Orchestra in the last concert of the season. 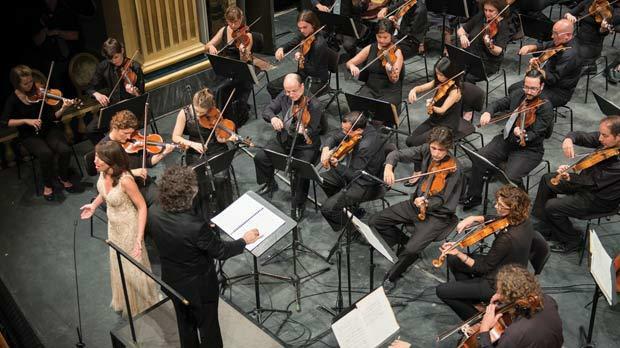 As national assets go, the Malta Philharmonic Orchestra (MPO) is a jewel in the crown. Conductor and artistic director Brian Schembri and no-holds-barred chairman Sigmund Mifsud have created an orchestra that believes nothing is impossible. “So often, rehearsals can be simply about organisation: you are expected to come in and say only, ‘here a little louder, here a little softer,’ which is all very primitive. The players expect something extra from you, an interesting interpretation, illuminating ideas, a fantasy. The idea of learning together is fundamental to Schembri’s philosophy. Orchestras, they say, get bored with too many words. But the well-chosen phrase or simile, a strength of Schembri strength, can make a player understand afresh why something is important, why it needs to be emphasised, structured or balanced in a certain way. Repeated by popular request the following evening, the programme journeyed from youthful beauty (Mendelssohn’s Hebrides Overture) to the first titan symphony of the 19th century (Beethoven’s Eroica) via the fading of an old man at life’s close (Richard Strauss’s Four Last Songs). Gillian Zammit, who studied with Paul Asciak, Carlo Bergonzi and Victoria de los Angeles, brought a crystalline fragility to the Strauss, her intimate soprano line entwining, counterpoint-like, within the instrumental texture. The third and fourth songs were especially sublime, with the soloist, leader and conductor combining to spin a dusky tone poem of Indian summer, Heldenleben farewell. The 600-seater Manoel Theatre is a small 18th-century room, with boxes so proximate you can almost touch hands across the auditorium. It’s the kind of space and (dry, hot) acoustic that would have been familiar to the classico-romantics. The Eroica may have been publicly premiered in a Viennese theatre nearly four times as large, but its first private performance in 1804 was in a Bohemian castle significantly more modest. Provokingly, this was Schembri’s second Napoleonic take in a month, having given us a couple of weeks previously an urbane evening of forgotten numbers by Isouard, the fin de siècle royalist with French leanings who ended his days in Paris. The vision of Beethoven the swarthy consularist, the democratic Bonapartist without time for emperordom or courtly courtesy, spurred an Eroica of hurtling, uncompromising character – virile, grand, defiant, rhythmically sprung, acidly argued. Observing the first movement repeat was a bonus. Another was the thespian pause before the penultimate slow episode of the finale (unexpected, these days, but to be relished when it has the benefit of Schembri’s naturalness). The speed, the adrenalin charge, the savage, rampant nobility of Beethoven at 33, thrilled to the core. The MPO, led by Marcelline Agius, gave everything. Rebecca Hall (flute), John McDonough (oboe) and Etienne Cutajar (horn) took deserved curtain calls. But many other players caught the imagination. The trumpets blazed with brilliant, fierce temper. And Brian Flescher, riding the orchestra from on high, wielding his sticks with the artistry of a drummer on a battlefield Clydesdale, commanded his kettle-and-skin beasts all the way from sensuously throated nuance to thundering roar, triumphal cadence to rattling musket fire. What riches will the next season promise?